Carol Boyd Leon has written "The Life of American Workers in 1915" for the February 2016 issue of the Monthly Labor Review, which is published by the US Bureau of Labor Statistics. A century ago in 1915 was when publication of the Monthly Labor Review started. It's roughly when my grandparents were born. I confess that I'm a sucker for these kinds of historical comparisons: for me, it's like a glimpse through a time machine. Here are some of the comparisons that caught my eye (with footnotes omitted throughout). "More than half (52.4 percent) of the 100 million people living in the United States [in 1915] were less than 25 years old; by comparison, the U.S. population has grown over the last century to more than 321 million, and only one-third of that total is under age 25. Not quite 5 percent of the population in 1915 was age 65 or older, compared with 14 percent today. Life expectancy at birth for people born in 1915 was just 54.5 years, whereas the most recent life expectancy estimate is 78.8 years." "About half the population in 1915 lived in rural areas, meaning areas with fewer than 2,500 residents. In 2010, by contrast, only 1 in 5 people lived in a rural area. Not surprisingly, mobility within the United States was more limited than it is now, and people born in the United States were likely to stay within their home state. In 1915, about 78 percent of U.S.-born individuals were living in the state in which they had been born, compared with 59 percent in 2010." Labor force participation rates (which of course measure only paid employment outside the home) show a substantial fall for men in every age group, and a large rise for women in every age group. "[I]n 1915, only an estimated 18 percent of the population ages 25 and older had completed high school, and only about 14 percent of people ages 14–17 were in high school. ... While failure to graduate remains a concern, more than 86 percent of the U.S. population age 25 in 2010–14 had completed high school or more." Nearly one-third of Americans were farmworkers back in 1910, compared with less than 1% of the workforce today. 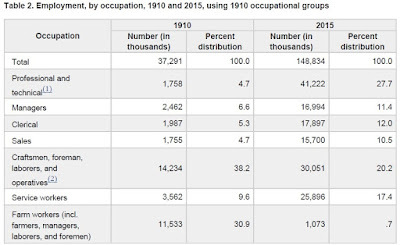 However, less than 5% of workers in 1910 were professional or technical workers, compared with about 28% of the workforce today, and less than 10% of workers in 1910 were service workers, compared with more than 17% today. 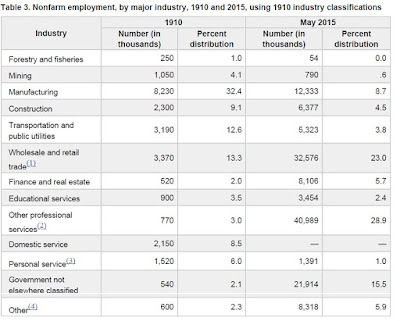 In terms of the nonfarm industries where people worked, about one-third of the workforce was in manufacturing in 1910, compared with under 9% today. 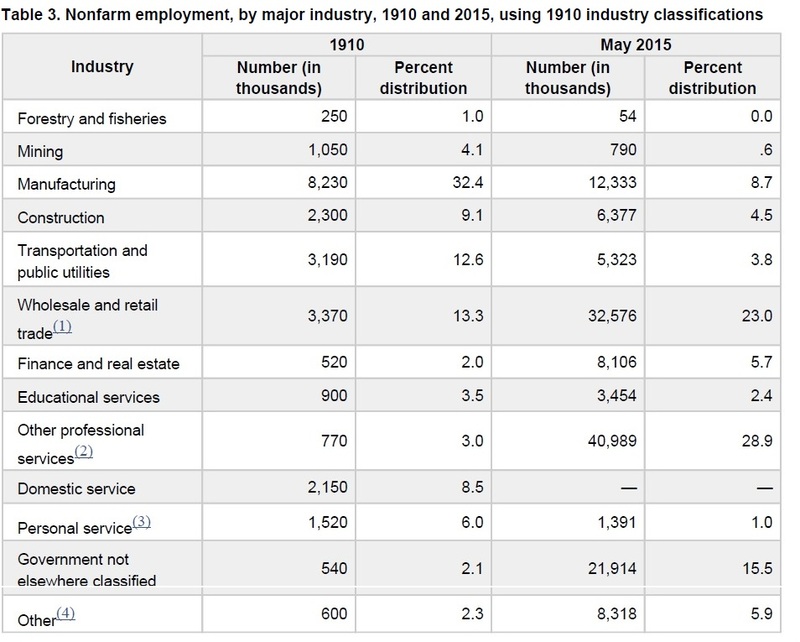 The share of the nonfarm workforce in construction was about twice as high in 1910 as today (9.1% then vs. 4.5% now), and the share working in transportation and public utilities was three times as high in 1910 as today (12.6% then vs. 3.8% now). 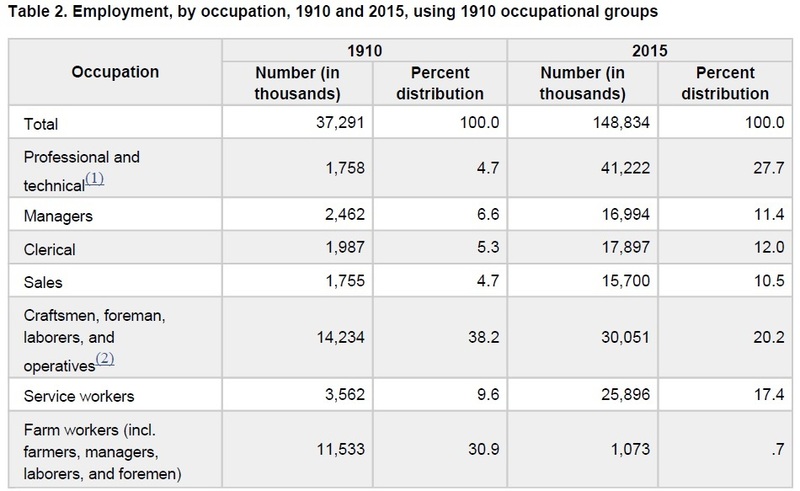 Nearly 15% of the workforce was in domestic or personal service back in 1910, compared with about 1% today. On ther other side, the share of workers in "other professional services" has climbed from 3% in 1910 to 28.9% today, and the share working in wholesale and retail trade and in government have also climbed notably. "If you were alive in 1915, chances are you rented your house or apartment; the ratio of renters to homeowners was about 4 to 1 in 1920. In contrast, by 2004, 69 percent of American families owned rather than rented their residence, although that proportion slipped to 64 percent by the fourth quarter of 2015.24 The cost of a home in 1915 was about $3,200 ($75,600 in 2015 dollars), compared with today’s median home value of $183,500. ... Mortgages were typically for just 5 to 7 years and required downpayments ranging from 40 to 50 percent of the home purchase price. In contrast, the median downpayment on a new mortgage in 2015 was 10 percent of the purchase price. Ethnic groups formed their own loan associations because banks could raise the mortgage rate, reduce the loan term to 3 years, and foreclose after two late payments." "Whether or not your abode was a single-family home or a crowded tenement, it probably was heated by a potbelly stove or by a coal furnace in the basement. It wasn’t until the coal shortage during World War I that oil or gas-powered central heating became a popular replacement for the hand-fired coal furnaces and stoves. Your home probably wasn’t yet wired for electricity; less than a third of homes had electric lights rather than gas or kerosene lamps. However, electricity was the byword of new middle-class homes, which sported electric toasters and coffee pots. ... Telephones could be found in at least a few million homes. However, direct dialing did not exist until the 1920s. If your home had an indoor toilet, the toilet likely was located in a closet or a storage area. It would be a few more years until it was common for toilets, sinks, and bathtubs to share a room. ... Although some households had running water in 1915, many rural families and city dwellers did not. Less affluent residents still heated a boiler full of water on a coal or wood range, rubbed clothes on a washboard, used a hand ringer, and hung clothes to dry. Homes without gas or electric heat were harder to clean because of soot from the fireplace or wood stove." "A high percentage of people in cities and factory towns walked to work. If you were like most people at the time, however, you lived in a nonurban area. If you didn’t work at home, you also may have traveled to your job by foot, or you may have gotten there on horseback or by mule. ... In urban areas, 1915–20 was the heyday of streetcars: miles of track peaked just 2 years later at nearly 73,000. Horse-drawn streetcars and buses led to home construction some 3 to 5 miles from downtown. Within the city, electric streetcars and trolleys may have been your means of transportation, speeding you to your job at 20 miles per hour. ... Although automobiles had only recently been invented, an estimated 2.3 million cars were registered in 1915. Olds Motor Works, which was early on the scene, produced some 5,000 cars in 1904, but these were overshadowed by the popularity of the more affordable Ford Motor Company’s Model T, colloquially referred to as “Tin Lizzy."" "The latest workplace rage was scientific management, which involved motion and time studies to determine the most efficient way to perform a work task. In 1911, Frederick Winslow Taylor wrote a seminal work on the subject—The Principles of Scientific Management—which suggested that greater workplace efficiency can be achieved by training employees to do a single job, such as opening mail, inspecting ball bearings, performing accounting tasks, or selling products. Taylorism pushed the division of labor to its logical extreme but did not take into account worker satisfaction. Similarly, in 1913, Henry Ford instituted the assembly line into his Ford Model-T car manufacturing plants to boost both efficiency and production." "For workers who were hired on a full-time basis, the workweek—when not reduced to part time— was generally long. Workers in manufacturing averaged 55 hours at work per week, and production workers in manufacturing averaged about 49 weekly hours of paid work. The latter figure may reflect that few workers indeed were compensated for time off, and factory workers hours could be shortened from one day to the next. It wasn’t until 1919 that close to half of American workers had a 48-hour workweek; in 1915, only one-eighth of workers had a workweek capped at 48 hours." "BLS reported about 23,000 industrial deaths in 1913 among a workforce of 38 million, equivalent to a rate of 61 deaths per 100,000 workers. In contrast, the most recent data on overall occupational fatalities show a rate of 3.3 deaths per 100,000 workers." "According to a U.S. News and World Reports article comparing income in 1915 and 2015, “back in 1915 . . . you were doing about average if you were making $687 a year, according to the Census. That is, if you were a man. If you were a woman, cut that number by about half.” In terms of 2015 dollars, the average pay of $687 for men is equal to $16,063, which is well below today’s income. Median annual earnings for men ages 15 and over in 2014 were $40,638 ($50,383 for men who worked full time), and median annual earnings for women in 2014 were $28,394 ($39,621 for women who worked full time). ... The wage comparison becomes even more dramatic if one considers that benefits now add substantially to the total compensation of some workers. 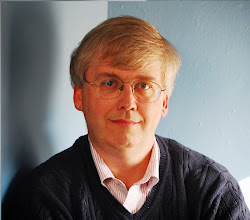 By contrast, benefits were meager or, more commonly, nonexistent a hundred years ago."